Click the "Appearance" tab in the Event Editor window. 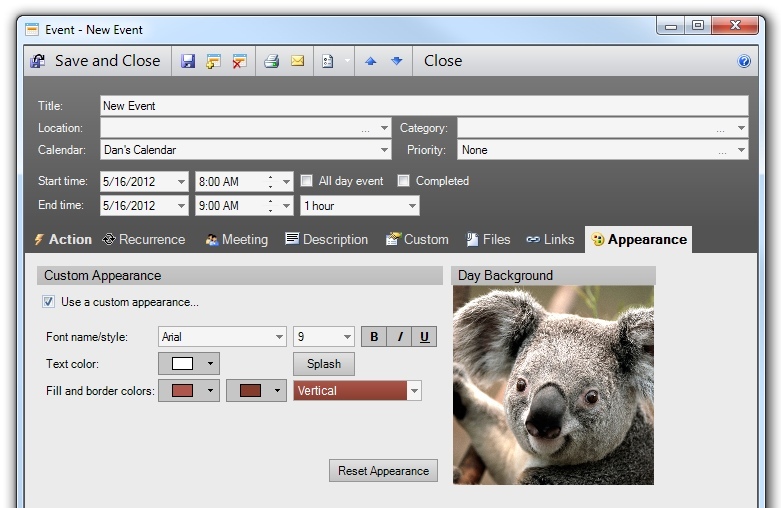 Events can have their appearance properties individually modified from the Appearance tab of the Event Editor window. Custom event appearances will override associated calendar, category, priority, and location appearances. Events can have day background colors or images. The day background will appear in the Month view, on the date of the event. If the Appearance Option has been set to allow customized appearances for individual events, event appearances can also be changed by clicking the event in the Calendar View and then using the Appearance Toolbar. The Appearance tab name will be bold for events that have custom appearances or day backgrounds. Splash - The Splash button will generate a random appearance. You can click it several times until you find a combination of colors that you like. Font name/style - These controls enable the font, size, and style (bold, italic, underline) to be modified. The font size values are in points. The bold, italic, and underline styles can be toggled using the B, I, and U buttons, respectively. Text color - This is the font color. To define a custom color, click the "More Colors..." button, below the list of pre-defined colors. 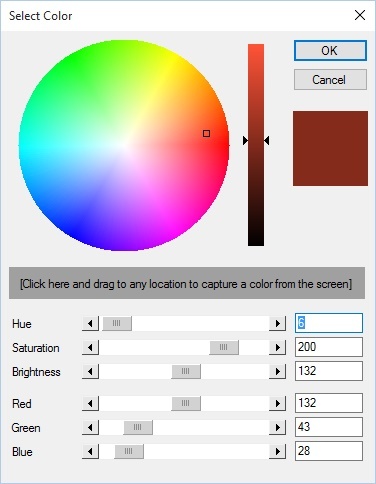 This will result in a Color dialog being displayed, where a custom color can be defined. Background colors - These are the background colors. You can select a primary background color as well as a secondary color. These will be blended together using the specified gradient style. Background colors can be set to "Transparent" if you don't want the event block to be colored. Gradient style - This is the gradient style to be used in blending the two background colors. It also serves as a preview of how the event will appear using the current settings. 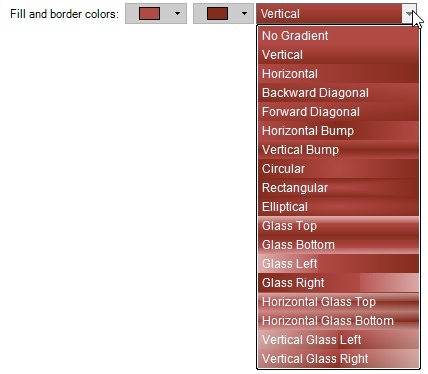 To select or preview other gradient styles, click the drop-down button. To remove a custom event appearance, uncheck the box on the Appearance tab, or right-click the event in the Calendar View and select the "Reset Event Appearance" command. 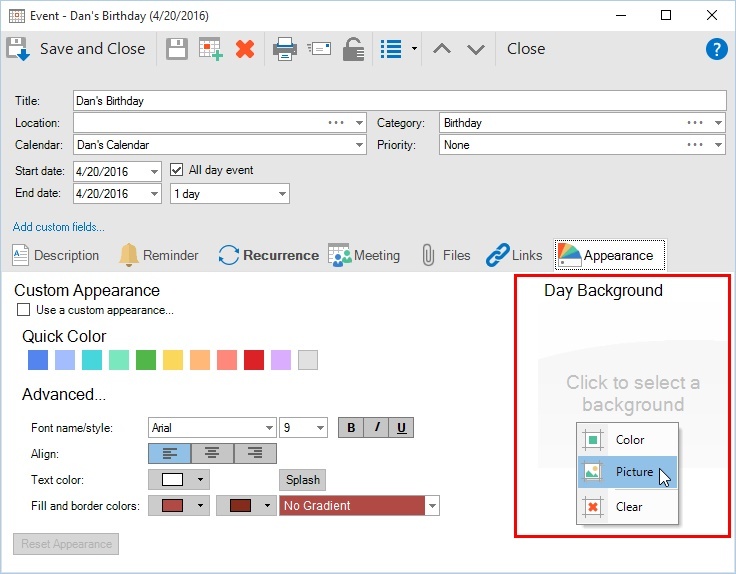 Day backgrounds can be linked to events using the "Day Background" box on the Appearance tab. See the Day Background documentation for more detail.